Барааны дугаар 9780199679591. Categories: Dictionaries, OXFORD. Authoritative and reliable, this A-Z guide provides jargon-free definitions for even the most technical mathematical terms. With over 3,000 entries ranging from Achilles paradox to zero matrix, it covers all commonly encountered terms and concepts from pure and applied mathematics and statistics, for example, linear algebra, optimisation, nonlinear equations, and differential equations. In addition, there are entries on major mathematicians and on topics of more general interest, such as fractals, game theory, and chaos. Using graphs, diagrams, and charts to render definitions as comprehensible as possible, entries are clear and accessible. Almost 200 new entries have been added to this edition, including terms such as arrow paradox, nested set, and symbolic logic. Useful appendices follow the A-Z dictionary and include lists of Nobel Prize winners and Fields’ medallists, Greek letters, formulae, and tables of inequalities, moments of inertia, Roman numerals, a geometry summary, additional trigonometric values of special angles, and much more. 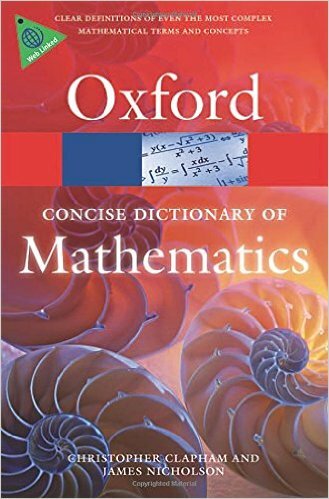 This edition contains recommended web links, which are accessible and kept up to date via theDictionary of Mathematics companion website.